Photoshop CC does not automatically install Bridge CC, the asset management program of the Creative Cloud programs. Not only do you need to download/install Bridge CC separately, it doesn’t include the powerful Adobe Output Manager (AOM), used to create web galleries and stunning PDF presentations. There is a plan to — hopefully — make AOM an optional install for Bridge CC. Until that time comes, however, there’s no reason why you can’t leave an earlier version of Bridge installed and use that version’s Output panel. 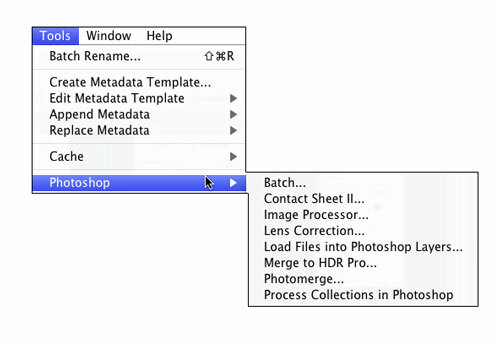 The first step in getting familiar with Adobe Bridge’s automation options is Bridge’s Tools menu. Note that if you have other Adobe programs installed, you’ll also see them listed in addition to Photoshop. Batch Rename. Rename a whole series of images in a single process! Select the image thumbnails or a folder of images in Bridge, open Batch Rename, construct the new filenames, and click the Rename button. When building the new file names, use the plus and minus buttons to the right to add or subtract each element. The various choices are shown in the box to the right. Each element will have one or two fields or pop-up menus to the right. Absolutely do not use a period (.) in any text field of the new filename. The only period that can be used in a filename is the one that’s automatically added immediately before the file extension. In the text fields, use only letters, numbers, underscores (_), and hyphens (–). Work with metadata templates. Metadata, that useful information about an image stored with the image, often is repeated from file to file. You might, for example, add exactly the same copyright information to each and every image you shoot. Or you might return from a job or trip or vacation with gigabytes of images shot at the same location or of the same subject. 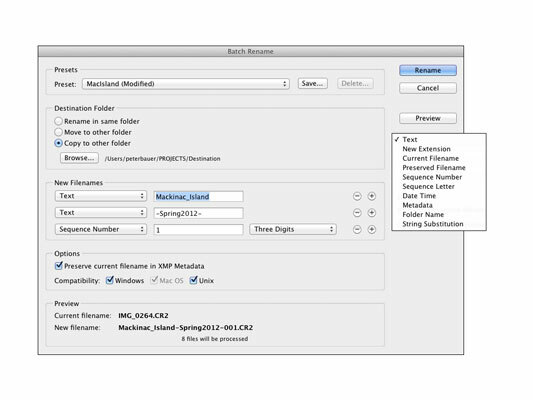 Using metadata templates enables you to quickly and easily add metadata to a series of (or even folders of) images, in just a couple of clicks. Manage Bridge’s cache. The cache is where Bridge stores thumbnails and metadata of images with which it has already worked. Accessing the cache for a folder (rather than re-processing each image every time you open the folder) can save loads of time. However, sometimes the cache can get corrupted. Should you see, for example, thumbnails of images that have been moved or deleted, go to the Tools→Cache menu and elect to purge the cache. You can also build and export the cache for the current folder through this menu, which is a great thing to do just before burning the folder to DVD or CD as a backup!